Disgraced ex-Detroit mayor Kwame Kilpatrick has failed again in his efforts to reduce the time he's spending in federal prison for corruption. Edmunds wrote that the motion did not show Kilpatrick's "actual innocence" and that the evidence "weighed heavily" in supporting the guilty verdicts. "(Former Detroit Mayor) Kwame Kilpatrick, (Kilpatrick’s long-time friend) Bobby Ferguson, (Kilpatrick’s father) Bernard Kilpatrick, (former director of the Detroit Water and Sewerage Department) Victor Mercado and (Chief Administrative Officer then Chief Information Officer to Kilpatrick) Derrick Miller… extorted municipal contractors by coercing them to include Ferguson in public contracts, and/or by rigging the award of contracts to ensure Ferguson got a portion of the revenue from those contracts…. Ferguson got tens of millions of dollars in work and revenues from municipal contractors." Federal Prosecutors in Detroit are announcing more corruption charges against former Detroit Mayor Kwame Kilpatrick. The indictments also include Kilpatrick’s father, Bernard Kilpatrick; former city contractor Bobby Ferguson; former Detroit Water Department head Victor Mercado; and former city official Derrick Miller. Representatives from the FBI, IRS, U.S. Environmental Protection Agency, Department of Housing and Urban Development are also on hand for the announcement. The new charges are a sign the years-long investigation into Detroit municipal corruption is approaching an apex. Kwame Kilpatrick already faces federal tax evasion and other charges for allegedly using a non-profit civic fund as a personal slush fund. Ferguson also already faces federal charges in an alleged city bid-rigging scheme. The other shoe is finally dropping on former Detroit mayor Kwame Kilpatrick. The US Attorney in Detroit is holding a news conference at 4pm to announce indictments against Kilpatrick, his father Bernard, and others allegedly involved in city hall corruption in Detroit. The U.S. Attorney's Office is considering prosecuting the mayor under the Racketeer Influenced and Corrupt Organizations statute, among other federal criminal laws, according to a source. The Department of Justice's Organized Crime and Racketeering Section reviews and approves each proposed federal prosecution under the RICO statute. So far, 14 people have pleaded guilty to felonies and one person has pleaded guilty to a misdemeanor in connection with the Detroit investigation and a spinoff probe in the city of Southfield. Those convicted include former Detroit City Councilwoman Monica Conyers. Disgraced ex-Detroit mayor Kwame Kilpatrick has ended up at a low-security federal prison in New Jersey. The Detroit News reports the 47-year-old Kilpatrick was transferred this week from a federal prison in Oklahoma to a federal detention center in Philadelphia before being moved to the Federal Correctional Institution at Fort Dix. The U.S. Supreme Court has made some controversial decisions this term, including Monday, when the nation’s highest court struck down a Texas law designed to make it harder for women to get abortions, something that is now a long-established constitutional right. But the court also did something that was entirely predictable and scarcely controversial at all. 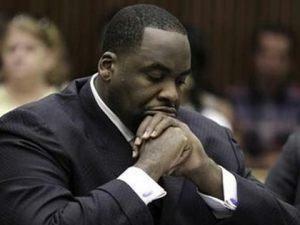 They declined to hear yet another appeal by former Detroit Mayor Kwame Kilpatrick of his public corruption conviction. That means that unless he comes up with yet other grounds for appeal, he is in federal prison until August 2037. Former Detroit Mayor Kwame Kilpatrick is asking the U.S. Supreme Court to overturn his corruption conviction and 28-year prison sentence. The request was recently made after a federal appeals court said in October it had no interest in taking a second look at the case. In 2013, Kilpatrick was found guilty of two dozen crimes, including tax evasion and bribery. A three-judge panel of the 6th U.S. Circuit Court of Appeals in August affirmed the conviction, but Kilpatrick wanted the full appeals court to hear the case.